Classic Film and TV Café: This Week's Poll: What was the Best MGM Musical of the 1950s? This Week's Poll: What was the Best MGM Musical of the 1950s? This week, the Cafe's poll dares to go where no classic movie poll has gone before! Yes, we have the nerve to ask you to vote for the one best MGM musical of the 1950s. Furthermore, to get the number of candidates down to a reasonable number, we're only providing seven nominees. Not fair, you say! True, it's not...but it should still be an entertaining poll. Summer Stock. 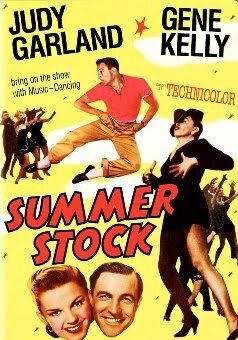 Gene Kelly's musical troupe invades Judy Garland's farm, resulting in the final pairing of these first-rate musical stars. Decked out in a tuxedo jacket, black fedora, and black nylons, Judy delivers one of her most fondly-remembered numbers with "Get Happy." The Band Wagon. Fred Astaire rescues a promising stage musical from the hands of an artsy-fartsy director. 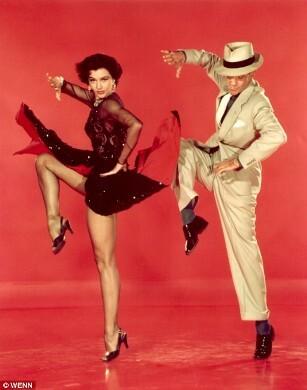 In addition to the lovely "Dancing in the Dark" number with Cyd Charisse, Fred gets to sing the classic "That's Entertainment." High Society. Bing Crosby, Grace Kelly, Frank Sinatra, and Celeste Holm team up for this musical remake of The Philadephia Story. Bing and Grace sing the big hit "True Love." Frank counters with a solo "You're Sensational." And Bing comes back with a duet with Louis Armstrong on "Now You Has Jazz." An American in Paris. The tuneful score by the Gershwins features "I Got Rhythm," "'S Wonderful," and "Our Love is Here to Stay." But the film's set piece is an ambitious 16-minute ballet that cost a hefty-at-the-time $500,000. Singin' in the Rain. Hollywood's transition from silent films to the talkies forms the backdrop for this musical starring Gene Kelly, Debbie Reynolds, and Donald O'Connor. 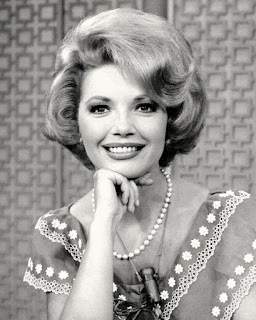 Kelly's splashing "Singin' in the Rain" number is a truly iconic musical number, though O'Connor's "Make 'Em Laugh" has its fans, too. Seven Brides for Seven Brothers. 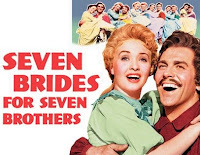 Michael Kidd's innovative choreography takes center stage in this colorful Western musical starring Jane Powell, Howard Keel, and six more brothers in search of wives. Click here to read a Cafe review of it published earlier this month. 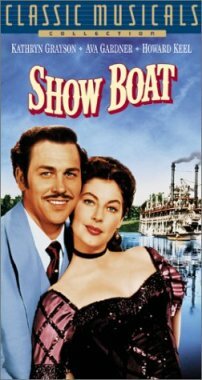 Show Boat. One of several Howard Keel-Kathryn Grayson pairings, this was the second version of the Jerome Kern-Oscar Hammerstein II stage musical. Most critics consider the highlight to be "Ol' Man River" which is sung by William Warfield. The honorable mentions are pretty impressive lot. 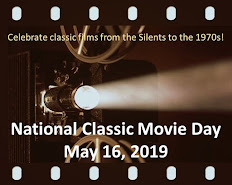 There's not room here to list them all, but they include Gigi, Silk Stockings, Les Girls, Brigadoon, Dangerous When Wet, and Annie Get Your Gun. 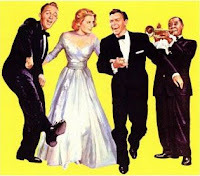 If you feel there's been a serious omission from the MGM 1950s musical vault, then please leave a comment! To vote for one of the seven nominees above, go to the green sidebar on the right. I am suffering from brain freeze. There are 3 of the musicals rotating around my brain, and I fear the death of many brain cells before I am able to stop the merry-go-round with a decision. Rick, you are a sadist! Arrrrghhh! I might be wrong, but I fear there's not going to be much of a contest here and predict "Singin' in the Rain" will be the winner. Maybe you should have asked, "After 'Singin' in the Rain' what was the next best MGM musical of the 1950s?" It's not a typical way to phrase a poll question, but I wouldn't have any problem with it. Singin' In the Rain will most likely win, and it has my vote. You can't go wrong with it. It is a timeless classic. I suspect SINGIN' will win, too. But I'm pulling for SEVEN BRIDES FOR SEVEN BROTHERS. Oh, I don't know, guys .... An American in Paris was a work of genius. Singing in the Rain was perhaps more traditional, also with genius. The Band Wagon would be No. 3 for me. I still can't decide between the first two! and lots of Cole Porter!!!!!!!!!!!!!! !